Mad Dog Friedman, harmonica player, musical innovator and founder of many popular Colorado blues acts over the years including King Comfort, Harmonica Loowinski, Papa Juke, the Mojo Medicine Show & Blue Lightning, has put together a new acoustic blues grass jam band with a unique blues style indigenous to Colorado in the 21st Century while still honoring the blues roots. We call this music Colorado Country Blues because it combines the “Colorado Sound” (jam grass) with traditional rural blues. The result is Mad Dog Blues, a coalition of top-notch, veteran musicians dedicated to exploring this new sound in both their song writing and performances. Along with Mad Dog Friedman on harmonica and Stevie D. on guitar, Mad Dog Blues (band) includes Jeff Becker (Hippie Buckaroos) on mandolin, Clark Chanslor on stand-up bass & and our “ringer” utility player, multi-instrumentalist Sean Bennight. We hope you enjoy our original “Colorado Country Blues” sound, a unique fusion of delta blues, bluegrass, honky-tonk, hokum and acoustic jam music. "Fine night of sharp, syncopated Blues. Wonderfully expressive performance with a depth of feeling and sense of humor and play you don't always find together." ~‎Duane Davis, owner of Wax Trax Records in Denver, Colorado. The Barrel at 251 Moraine Ave.
Colorado Blues Society's IBC FINALS at The Dickens Opera House at 300 Main St.
$10 cover goes to support the winning acts' ttrips to Memphis and the Interantional Blues Challenge. 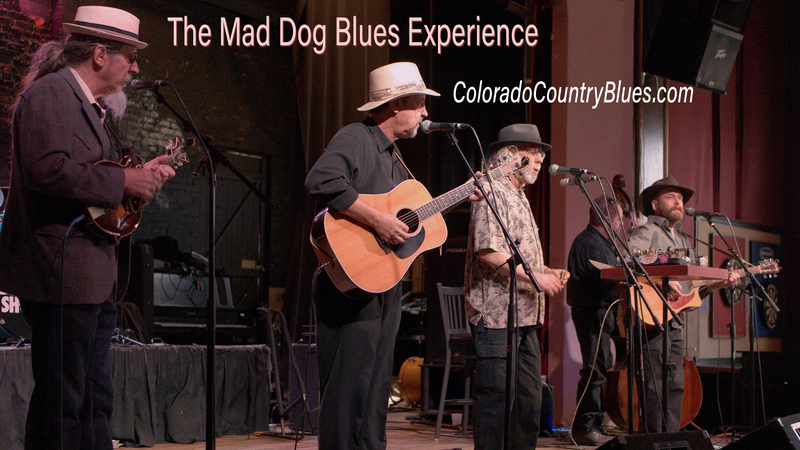 Mad Dog Blues (Band) at our second gig at The Barrel in Este Park, Colorado, on October 21, 2018. Listen to Happy Dance, the first album of Mad Dog Blues (Band), recorded live on KGNU Radio on November 13, 2018. If you are just interested in the Mad Dog Blues Duo please check out our online duo demo video of all original music at: https://youtu.be/-O1qXifRN9U and/or listen to some early live duo audio recordings from Jake's Beer Garden on June 30, 2018: https://maddogfriedman.bandcamp.com/album/mad-dog-blues-duo-demo.